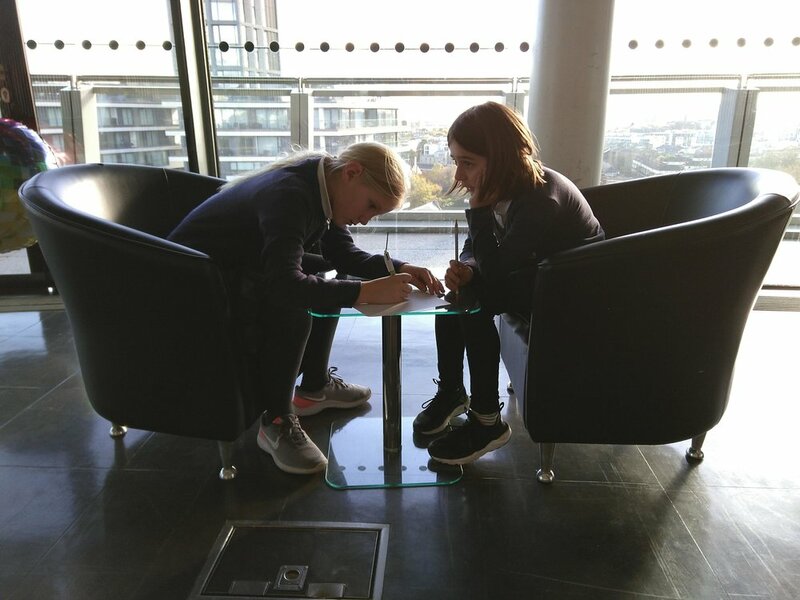 On Monday 29th October, the children from the Gillespie Science Committee attended the Equal Play Symposium at City Hall. 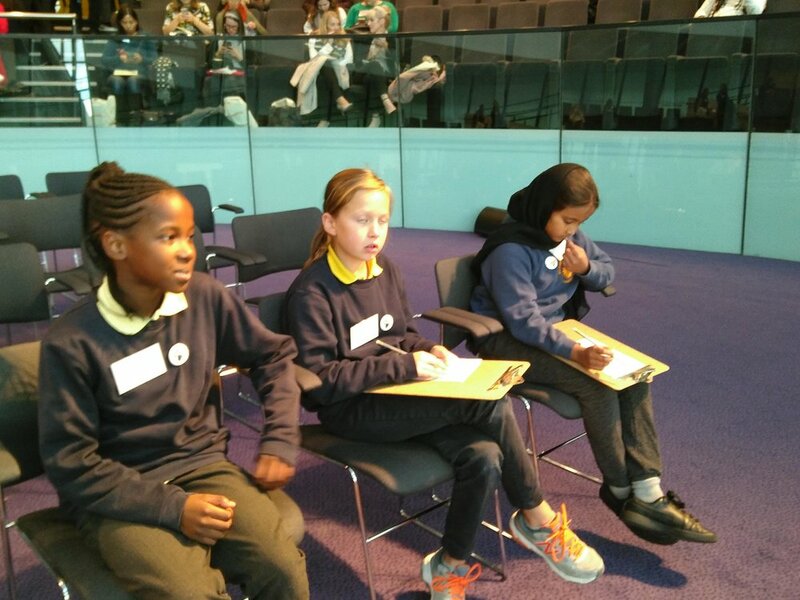 This event saw the launch of the brand new Gender Action Award, which schools in London can work towards. 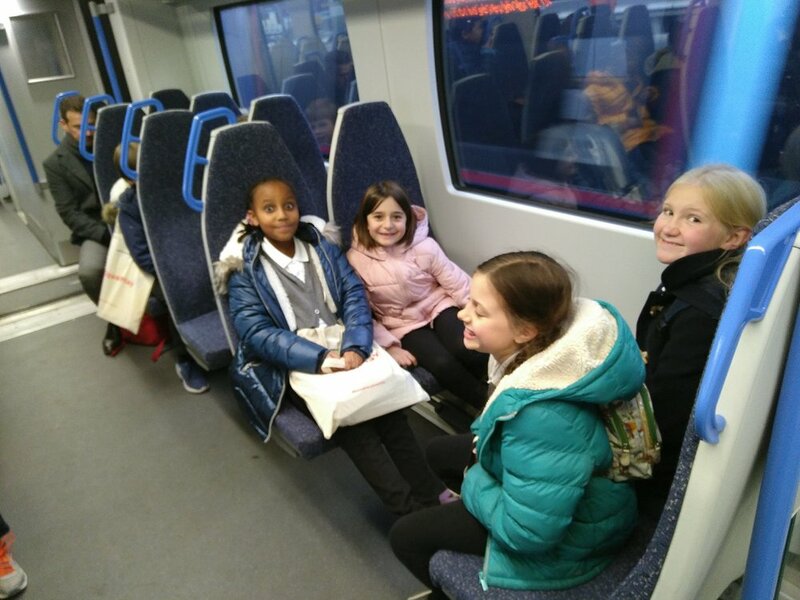 Here the children write about their trip, in the hope of sharing their learning with other children and encouraging schools to take part in the award. First we went to the Underground. That was easy but we went at rush hour [rush hour is a time during each day when traffic is at its heaviest]. 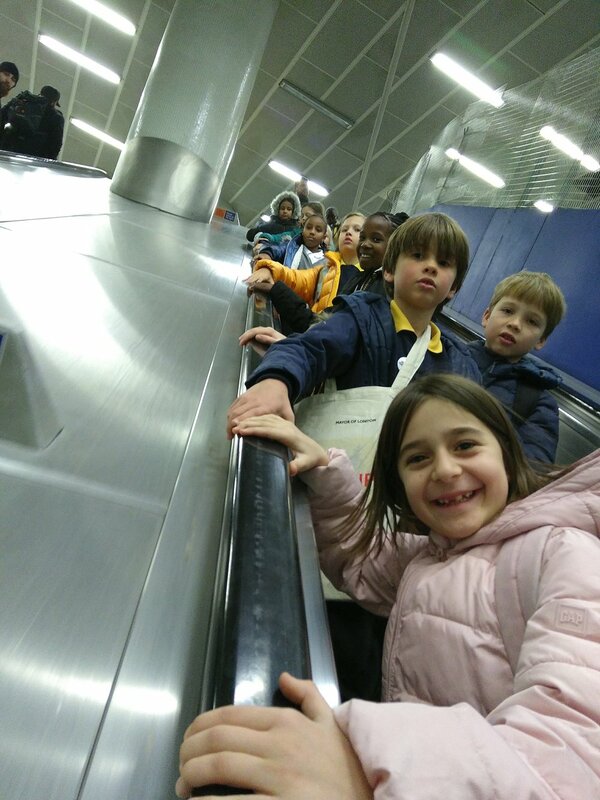 It was loaded with people, we had to squeeze into the tube. We got off at Kings Cross and St Pancras and the station was full with people. 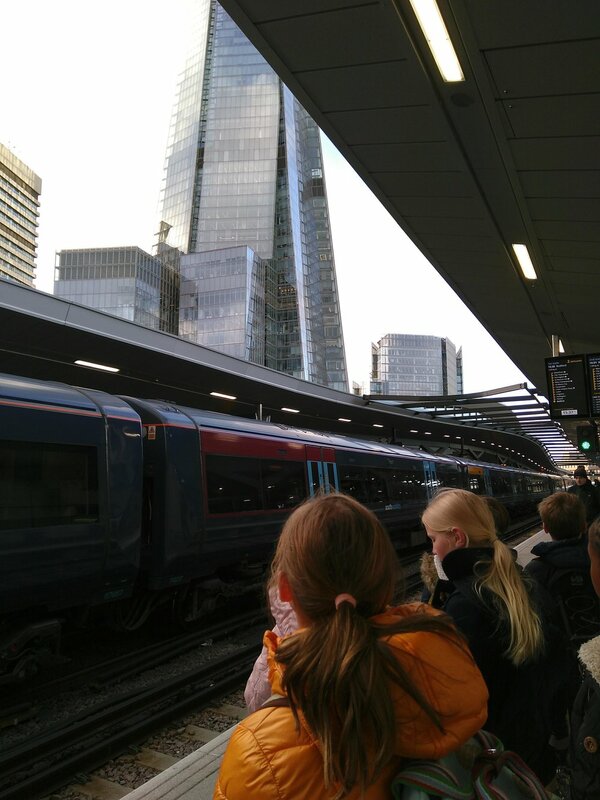 We thought we would take the northern line but it was too crowded so we went outside and got the train instead to London Bridge. We walked right next to the Shard then we walked to the river and saw Tower Bridge! Then finally we got to City Hall. The first thing we did when we got there was enter the chamber (the place where the questions are asked and answered). 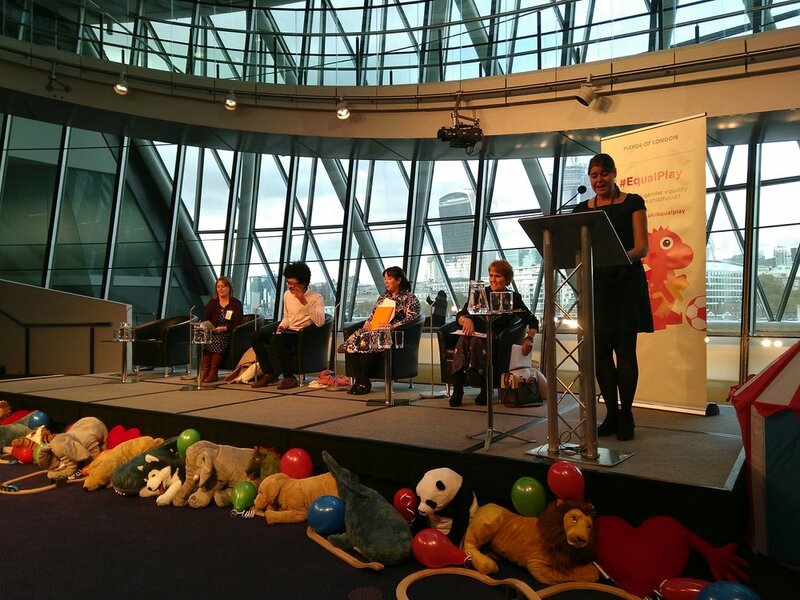 Joanne McCartney (Deputy Mayor of London) welcomed everybody and said that the Mayor wanted every child in London to have fair play. The next person to talk was Rosie Rios. She was the treasurer of the United States of America. Rosie talked to us about how few statues of important women there were and she wanted to have more of them. She also campaigned to get a woman on US currency because there never had been any before and the US was one of the only countries that didn’t have women on any currency. After her it was Sam who worked for the Fawcett Society. The Fawcett Society is named after Millicent Fawcett. A statue of Millicent was set up in Parliament Square earlier this year. She fought for women’s rights to be allowed to vote. Emma was next up. She worked for the company Lego. She pointed out about how different toys were sometimes aimed at different genders. Emma wanted to stop that and in our bag she put pieces of Lego in it and you had to make it into a duck without instructions. Guy from the advertising standards authority was the last person to speak. He checks adverts to see if they are good to be shown and stops ones which are not. Finally, we asked our questions. Ahlam and Cici asked about why toys and books show girls with long hair and boys with short hair, when lots of girls want to have short hair and boys long hair. They told the story of how Ahlam went to the hairdressers and they were reluctant to cut her hair short. They showed everyone our Lottie doll that now has short hair because we cut it off, and which we think looks really good and is practical. Everyone clapped and said well done. Then Daniel and Zach asked their question. It was about branding and they told the speakers how there shouldn’t be branding based on gender because it might make you feel judged. They gave the example of blue and red colours used for science and adventure books and pink and purple colours for fairy and fashion books. We didn’t have time to say this but we also think it’s unfair as well because we know lots of boys who have pink or purple as their favourite colour but still they feel judged. Finally, it was Ada and Daisy’s turn to ask their question about adverts. They want adverts to be more positive for boys and girls and not tell them which toys or clothes are for boys or for girls because they should be for everyone. They asked what children and adults in the room can do to change this. 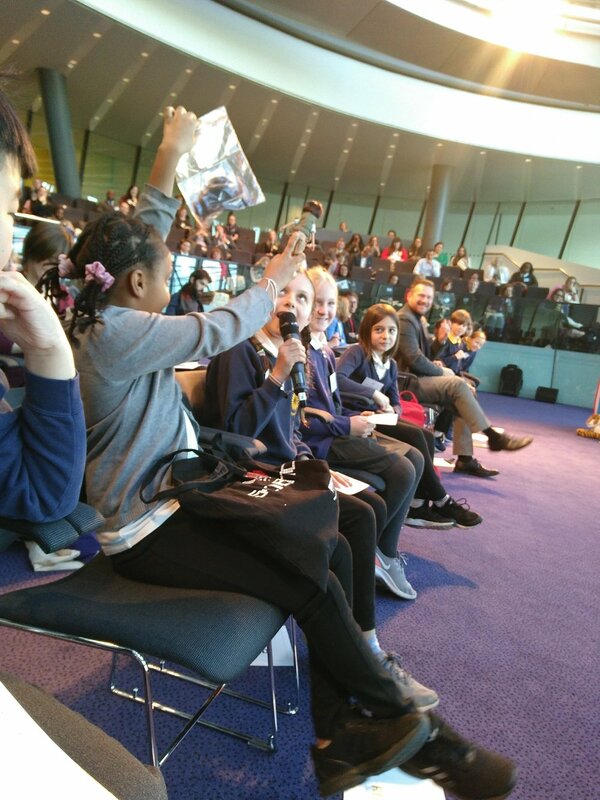 The speakers all responded in the way we wanted them to and were very interested in the Lottie doll, they all wanted to have a close look at her. Guy said that we could complain about adverts that we think are harmful by going on the ASA website. Everyone said we asked good questions and encouraged us to keep going with what we’re doing. But we didn’t really get an answer to our question about branding so if you have any ideas let us know. Rosie was very kind and signed a dollar note for each of us next to where her signature is already printed on the note. They will be a very special memory of the day. Our second session we went to was the toy handling section. We went to the stands there. The stands had different toys from the Victorian time to more modern days and people from the V&A Museum of Childhood to explain how they all worked if we needed help. For example the Victorian toys were flick books with no words and wooden toys you had to make move physically. We noticed that the modern toys you didn’t really have to make move. Some of our favourite Victorian toys are the zoetrope and magnetic puppet. 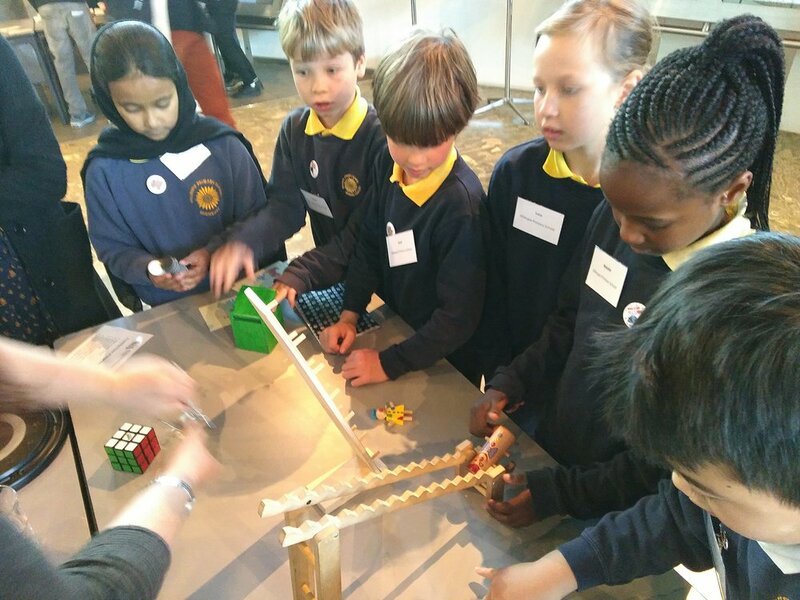 Our modern favourites are the Rubik cube and the magnetic game. We would like to make our own zoetrope. After the toy handling session, we went to a room called Committee Room 1 where we watched interesting adverts. Then we all had to talk about which advert we enjoyed and which we did not enjoy and why. All of us then voted on which was the best advert. The advert that most people liked was surprisingly the one called This Girl Can. Most of the children in the room preferred the advert by the IET showing engineers who are women having a massive pillow fight with explosions. We thought it looked like fun! After we had lunch (sandwiches) we went downstairs to our room as we thought we would do blogging there. 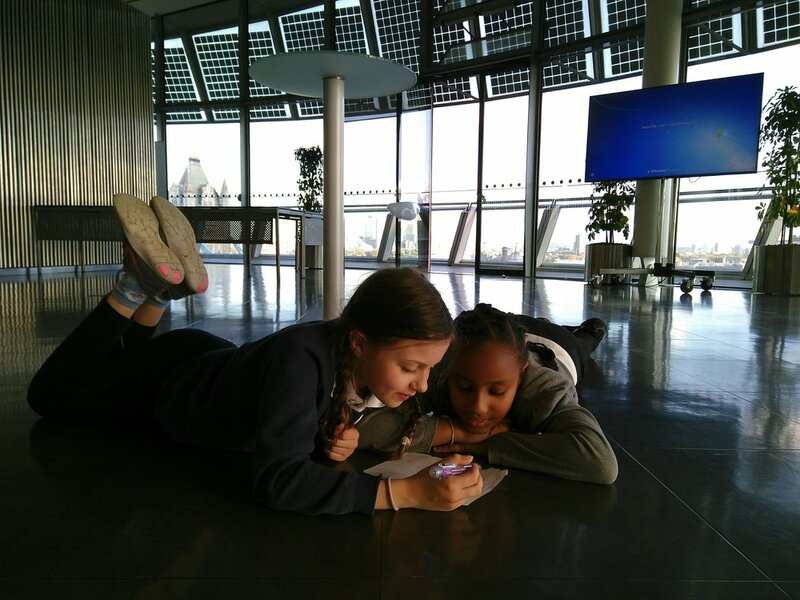 However when we got down there Josie (the person that was looking after us) told us that we could do our blogging upstairs at the top of City Hall, in the London Living Room! We were really excited, until we started walking up the ramp. It was half a mile!!!!!!! We walked up and up and up and up and up. I had begun to get quite dizzy then at last we arrived at the top. 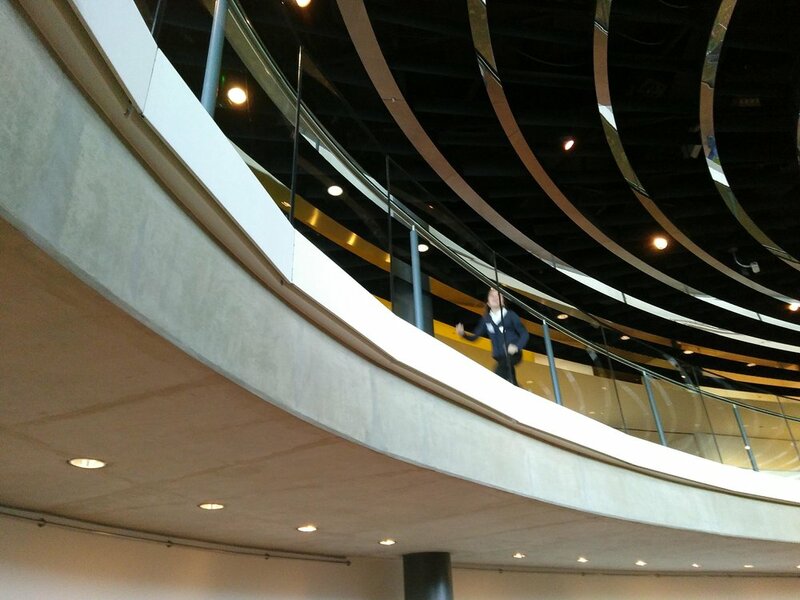 We were in a big room and we ran towards a large circular balcony, looking over London. As we looked out of the large, glass windows, we saw a sensational view. In front of us was Tower Bridge with shades of blue and gold. Below that, the river was murky brown with boats bobbing on top, slowly drifting along. When we looked West, we could see the Shard shimmering in the sunlight. We were fascinated by all of the towering buildings around us. When we looked North, we could see the Tower of London which seemed a lot smaller than the Gherkin, the Cheese Grater, and the Walkie-talkie. When we looked to the South, we did not see towering buildings, but we saw lots of fluffy white clouds floating in the bright blue sky. The room we were sitting in, writing this, had lots of rainbow balloons and many squishy, comfy chairs. Professor Gina Rippon came to the stage to talk about brains. It was very interesting and she said that boys’ and girls’ brains are actually different. But also that everyone’s brains are different! We found it interesting because so far she was the only person who had talked about brains. She said that our brains are plastic, they can change shape. She also said that girls’ and boys’ brains aren’t that different to start with, but they get more and more different the older they get because they have different journeys. Girls are taught to be perfect and boys are taught to be brave. Different types of praise changes how you see yourself. Our brains can change and they change all the time. When you become good or bad at something our brain changes and adapts. How different are baby boy and girl brains? They are really very similar. Babies are picking up social information. They can tell the difference between their mother’s voice and someone else’s voice within three days. Young children are learning new skills very often. Girls are given different choices therefore making them have different skills. This is why it’s so important for boys and girls to all get to play with lots of different toys so they learn lots of different skills. And read about lots of different people in books so they know about lots of different things they can be when they grow up. So that all children can choose who and what they want to be.